It’s no secret to anyone that knows me that I love to travel. This past year has actually been a slow travel year for me. We went to London in April and did not take any trips after that – until earlier this month (October 2011). It has been a long term desire of mine to visit China. The logistics of travel to China is quite daunting however. It is also hard to decide where to go. 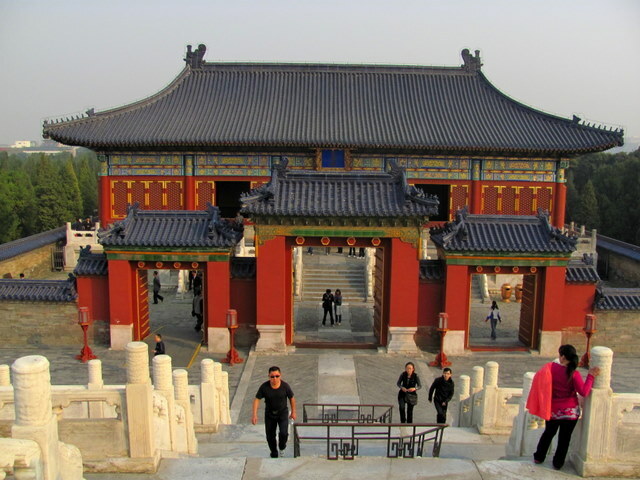 I knew that I wanted to visit the Great Wall, the Forbidden City and the Terra Cotta warriors in Xian. But putting together the right trip (or finding the right tour) can be difficult. Earlier this year, though, we were told about a tour being put together by the Austin Chamber of Commerce. It is the first tour organized by the Chamber here. But a friend of mine actually went to China on a tour with her Chamber of Commerce in Santa Cruz, CA. When I told her about this trip, she strongly encouraged me to go. John and I were hesitant because we are not in love with the idea of tours where every minute is planned out for you. However, given the incredible cost of the trip ($1999 per person, including all hotels, meals, airfare from LA to China, and air and bus travel within China), we decided to go. This will be my first post on our experiences over in China (there was way too much to put it all in one post). 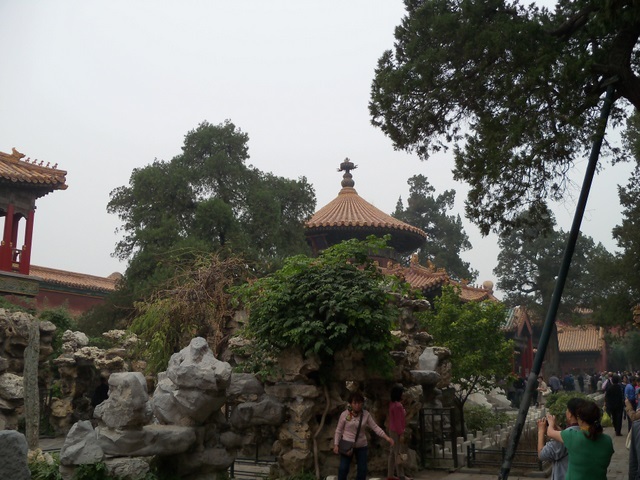 We got to visit four cities on this trip – Beijing, Shanghai, Suzhou and Hangzhou, starting with Beijing. We left LAX at around 1 pm and after a stopover in Shanghai, arrived in Beijing in the late evening. This allowed us to get to the hotel and go right to sleep. This schedule worked really well as we never really experienced any jet-lag after arriving. 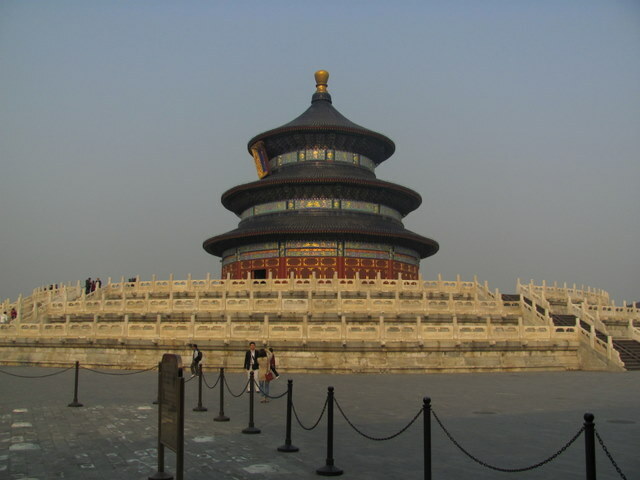 The next day, bright and early, we started our tour of Beijing by visiting the Temple of Heaven, which dates back to the 15th Century. In the words of the World Heritage Centre: “In its overall layout and that of its individual buildings, [the Temple of Heaven] symbolizes the relationship between earth and heaven – the human world and God’s world – which stands at the heart of Chinese cosmogony, and also the special role played by the emperors within that relationship.” This was a temple that the Chinese emperors would come to for sacrifices. It was off limits to the public. Fortunately it is now open to everyone. What a beautiful complex! Much of it was restored prior to the 2008 Olympics. It is just beautiful! This was only our first stop in our week in China and I was already amazed and delighted. Since the trip was sponsored by the Chamber of Commerce, a good part of the trip was spent at various factories where we would learn about various things – and then get the high pressure sales. The first such stop was to a Jade factory. I have to say that the items we saw were spectacular – from birds to cabbage to pagodas, ships and so many other types of jade goods. I ended up buying a jade pagoda (I have such a fascination with pagodas). Of course most of the things that I liked were way too expensive. But one can dream, n’est-ce pas? After the Jade Factory, our next stop was to the Ming Tombs (or to be more precise – a small section of the Ming Tombs complex). 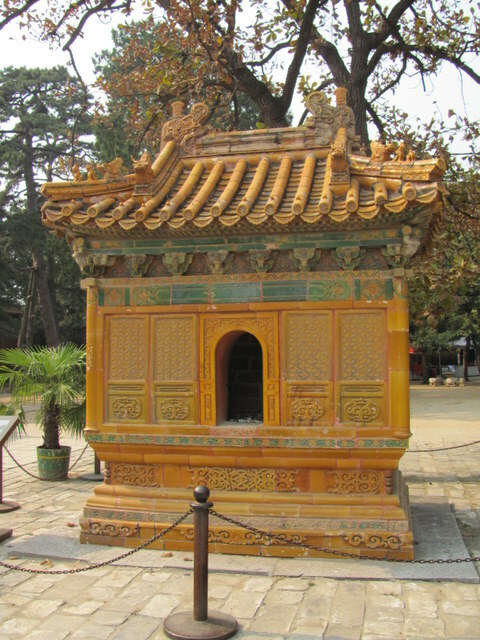 We were at the tombs at Changling, which is the tomb of Emperor Zhu Di and his empresses. The complex dates back to the 14th and 15th centuries. Again, it is a magnificent complex of buildings. Some of the side buildings, such as vendor carts and silk burners, are almost as beautiful as the main buildings of the complex. While the Tombs and the Temple of Heaven were fantastic, what was to come later that afternoon was one of the highlights of the trip. 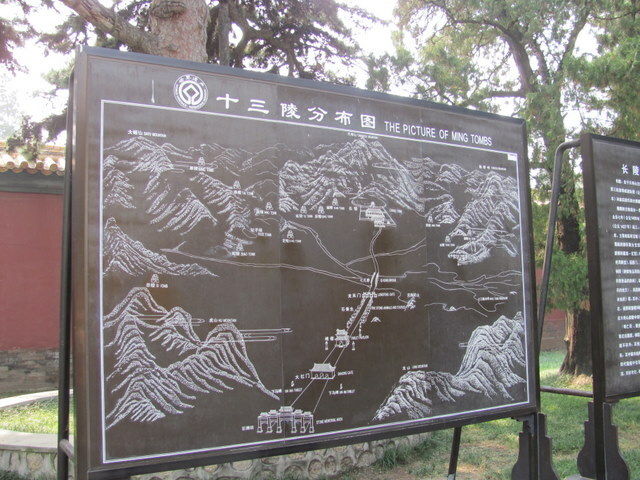 We went to the Great Wall and had about 90 minutes to climb as far as we wanted and enjoy the amazing site. The Wall was started around 476 BC, with construction ongoing until the 17th Century. The wall is over 4,000 miles long – that would stretch from Miami to Seattle and from there down to San Francisco. Needless to say – it is monumental. Unfortunately not all 4,000+ miles still remain. The section we climbed ended. You could see the ruins of other parts of the Wall right in front of you. We took our time and climbed as far as we could go on this section of the Wall. If you look at our picture above, we climbed to the little red building you can see on the top left. The stairs are all different sizes, ranging from just a few inches to nearly 3 feet. The day we went up, the air pollution was fairly bad. This limited visibility to some extent. But it was just glorious up there. And so quiet (until the train came through). I highly recommend visiting the Wall and climbing as far as you can go. Take it slow – there’s no rush. It is worth the effort. We finished off our day with a Roast Peking Duck dinner. This was one of the few meals we had in China that I really enjoyed. Unfortunately, most of the food we were served was not great. But this meal was. I love Peking Duck, especially the skin. Yum yum yum!! 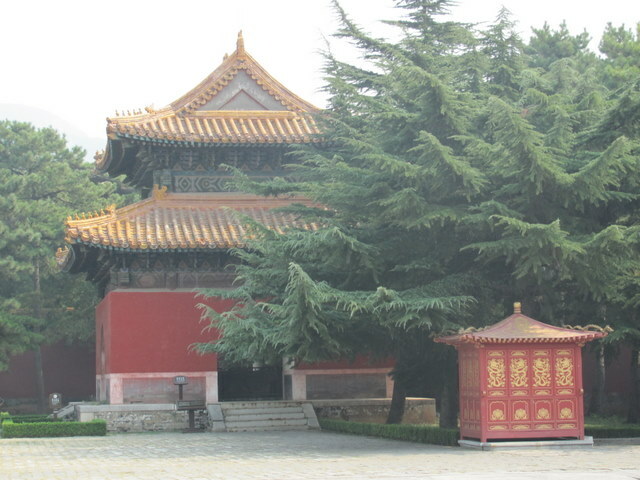 In the next post, I will talk more about the sites we saw in Beijing. 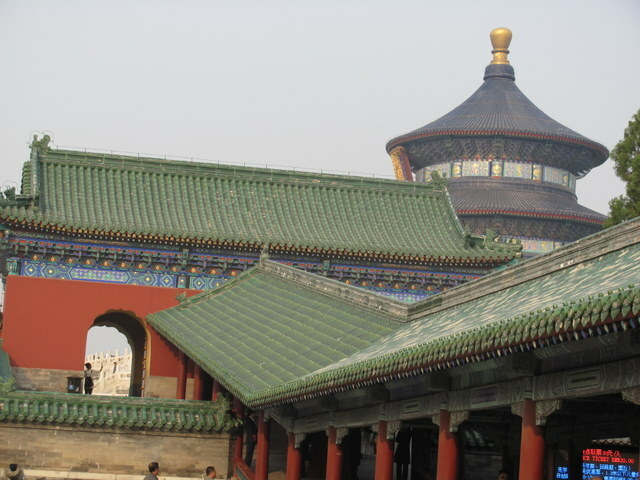 To see my photos from Beijing, click here. Growing up, there were a couple of places that I always dreamed of visiting. London was one of those places. I grew up reading books about Queen Elizabeth I and King Henry VIII. I was always fascinated with that time period in particular. In 1999, I had the opportunity to go to London for the first time. I had very high expectations about that trip. Unfortunately, the actual trip was not as good as the expectations of the trip. We got to London and (surprise, surprise) the weather was dreadful. It rained every day. I had wanted to go see Phantom of the Opera in the West End, but again was disappointed as there were no unobstructed view seats available during our time in London. We ended up seeing another show, which John loved but I did not care much for. Meanwhile, through the years since then, I have talked to so many people that just adore London. So I knew that we had to give it another chance. That chance came in April, 2011. We decided to go to London to celebrate our 17th anniversary. Shortly after we made our plans, Prince William and Princess Kate announced their wedding date. As it turns out, we were in London for the week leading up to the wedding. We came home before the wedding took place, though. Well, what a different trip we had this time. We got off to a bad start with bad weather in Texas which caused us to miss our flight to London and to have to spend the night in Dallas. Ugh! Air travel is so annoying. However, after that, everything worked wonderfully throughout the trip. We got to London on April 21. We were greeted by the most spectacular weather you could hope for. It was sunny, clear and warm for almost the entire time we were there. We only had rain one time, and it happened to be at a time when we were in our room resting. So the weather never interfered with our plans in any way. Wow – imagine great weather in London. G-d was smiling down on us. Because of the overnight delay in Dallas, we ended up having tickets to a West End show on the same day we arrived in London. Normally I would not do that since we need time to recover from a long flight. We got into London around noon and were able to rest until dinner time so that we would be able to enjoy the show. The show we saw was “Priscilla Queen of the Desert.” If you have seen the movie, then you pretty much know what the show was. Let me just say – it was AWESOME. We enjoyed it so much. I will definitely see it again if I have the chance. The music was great. The staging and costumes were also top notch, as was the acting and singing. What a delightful way to start our week in London. I spent a considerable amount of time researching what to do in London. The first time we were there, we did not get to see many museums so I wanted to make sure we did go to some this time. Most of the major museums in London are free. That’s great because everything else is pretty expensive. The first museum we went to was the British Museum. This museum is a real treasure trove. Some of the more famous items in the collection are the Rosetta Stone, the Elgin Marbles and the Portland Vase. I won’t go into all of the wonderful things you can see there, as there is just too much to describe. The Saturday we were in London, we went to the Portobello Road Market. This is blocks and blocks of shops and stalls along and around Portobello Road. There were literally thousands of people out for the market (especially since the weather was so beautiful). There were tons of antique stores with some really interesting items. We didn’t buy too much because we really didn’t need anything. But it was fun to browse the stores and to people watch. London has long had a reputation as a culinary wasteland. Well, I could not disagree more. I think the selection of restaurants and the food options in London are amazing. I am not a big fan of Chinese food, but the Chinese restaurants we have been to in Leicester Square are outstanding. They were also filled with Chinese patrons, which is always a good sign. There is great Indian food, as well as Ethiopian, Turkish, Greek, and just about any other type of food you could want. This is, after all, a large, modern metropolis. Much like in New York, if you are looking for it in London, you will probably be able to find it. Of course, I cannot mention this trip without talking about “The Wedding.” We were in London for the week leading up to the wedding of Prince William and Kate Middleton, and came home 2 days before the actual event. While we were there, we saw the city being decked out and dressed up for the upcoming nuptials. We saw the grandstands/viewing areas being put up near Buckingham Palace. The lampposts along the Mall were all decorated with flags and banners. Everything was gleaming. There was a definite buzz about the upcoming wedding everywhere we went. Due to the crowds of people, we did not even try to get into Westminster Abbey this trip. When we drove by, the lines were enormous and seemed to go on and on. All in all, this was a wonderful trip to a wonderful city. It clearly made up for any difficulties the first time we went to London. I am sure that I will be back (next time, maybe as an anchor for heading north to Scotland). To see some of my photos from London, click here. Savannah is one of the truly great cities in the South. I have been there close to a dozen times, and yet I still enjoy every time I am there. I recently took a road trip to Florida and on the way back, we decided to spend a few days in Savannah. I should mention that summer is not the ideal time to visit – the climate is very hot and muggy. But it is not the end of the world either and if it is the only time you might be able to go, I would not skip it just because of the weather. Savannah is one of the oldest cities in the US. It dates back to 1733, when General Oglethorpe and his crew landed nearby. It became a major port for shipping of cotton, and thereby became quite prosperous. 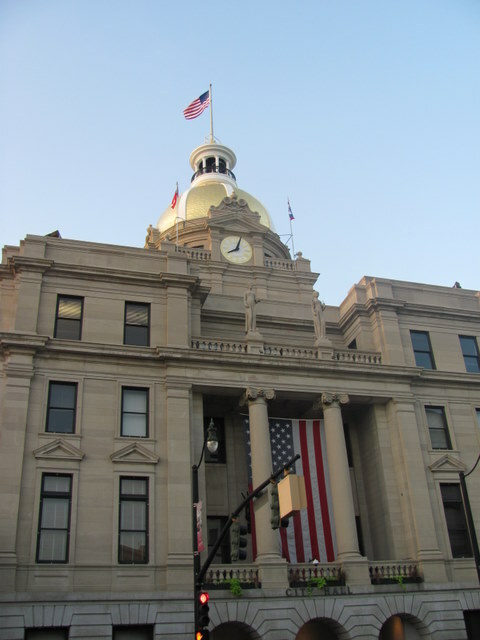 During the Civil War, it was spared the fate of Atlanta (burned by General Sherman). Lucky for us! Today, approximately 7 million people visit per year (according to the Savannah Chamber of Commerce). One of the oldest parts of the city is along what is now River Street. This is an area paved by the ballast of the ships that came from England – they would come empty to take cotton, so the British filled them with ballast, which they would then dump to load the cargo. The locals decided to use these stones as a building material, both in their roads and in their buildings. (When the British realized this, they started to require payment for the ballast). Like most parts of America, this area has been taken over to some degree by large corporate groups (restaurant and hotel chains), but there is still a lot of character to the place. This is one of the things that I love about Savannah. It has maintained its uniqueness. 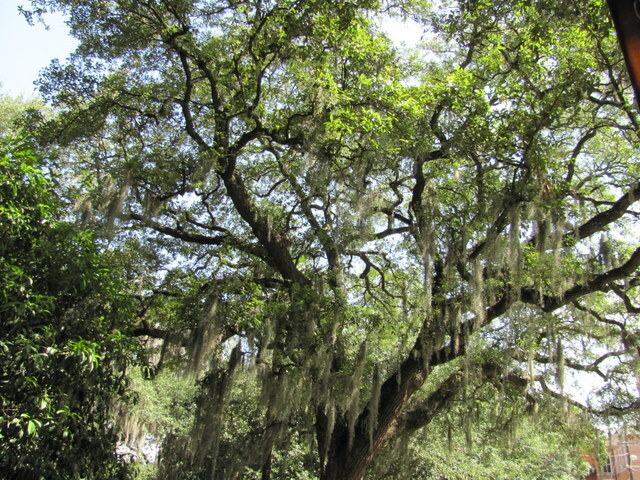 Savannah was the original “planned” city – meaning that it was laid out by design as opposed to organic growth that was more common in the large cities in the Northeast. The city was designed with 24 squares. Each square represented the center of its “community.” 3 of those were lost in the 20th century, but one was recently reclaimed. So there are still 22 of these squares. They are lined by beautiful mansions of all architectural styles, as well as houses of worship. 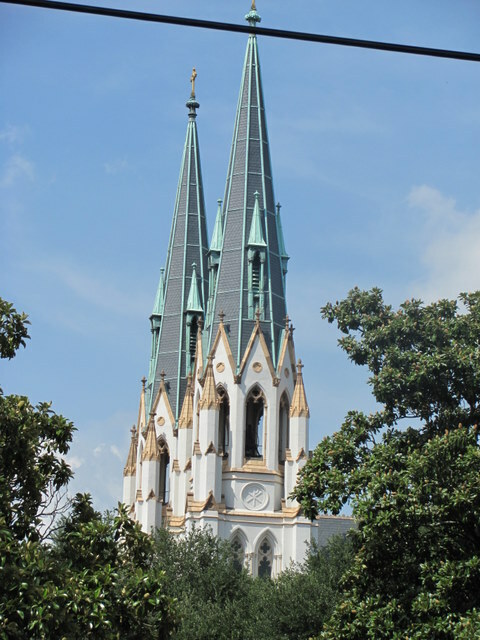 Savannah was founded with the idea of freedom of worship. This was put to the test fairly quickly when a boatload of 42 British Jews arrived from London on the William and Sarah. They founded Congregation Mickve Israel in 1735, making it the 3rd oldest Jewish congregation in the US. 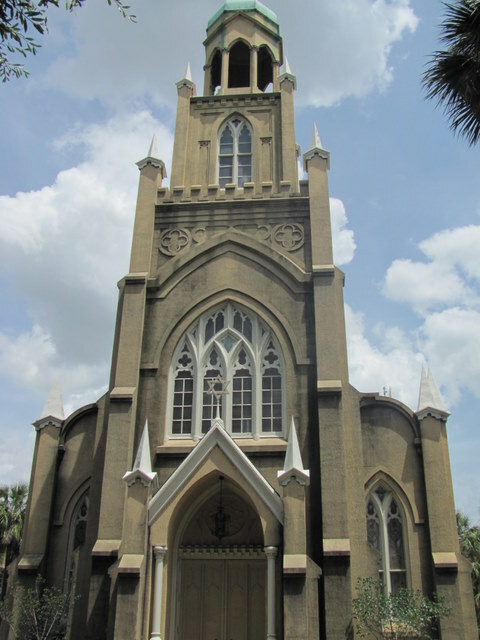 The 1995 publication of Midnight in the Garden of Good and Evil, as well as the 1997 movie based on the book created a buzz about Savannah as well. The book is based on a true story, though it was certainly embellished a lot. You can visit the Mercer-Williams House, which is one of the main settings of the book and movie. I have actually never done this, though I have toured other Houses (The Owens-Thomas House, for example). Another gem from the movie is Lady Chablis. I can honestly say that “she” is one of a kind. I actually got to see her drag show in Savannah long before the movie made her famous. She now only is in town once or twice a month, so it is not as easy to catch her show. Anyway – I am not usually a fan of drag shows, but she was spectacular! There is so much to see and do in Savannah. I highly recommend it. I doubt that you would be disappointed. To see some of my pictures, click here. I recently came back from a trip to Cleveland, OH. I know what you are thinking. Why Cleveland? I got asked that question a lot. It’s hard for the city to recover from its “mistake on the lake” reputation. My reason for going was primarily to visit a good friend of mine that I had not seen in years, and to go to what many consider the best roller coaster theme park in the country – Cedar Point. Anything else would be a bonus. I have to say that with one exception (I got a ticket from a very surly officer), I thoroughly enjoyed my time in Cleveland. It is actually a very pretty city set on Lake Erie. And it has a lot to offer. Sure – it is not New York or LA, but that does not mean it should be overlooked. Of course, as this was my main goal, the first thing my friend and I did was to go to Cedar Point. This is a little over an hour west of Cleveland, in a town called Sandusky. It did not disappoint. The roller coasters were incredible. We also lucked out on the weather – it was comfortably in the low 70’s and overcast. So we were not baked in the sun. We also did not encounter long lines (a big plus). The longest we waited for a ride was about 30 minutes. But most of the time, we waited 10 minutes or less. 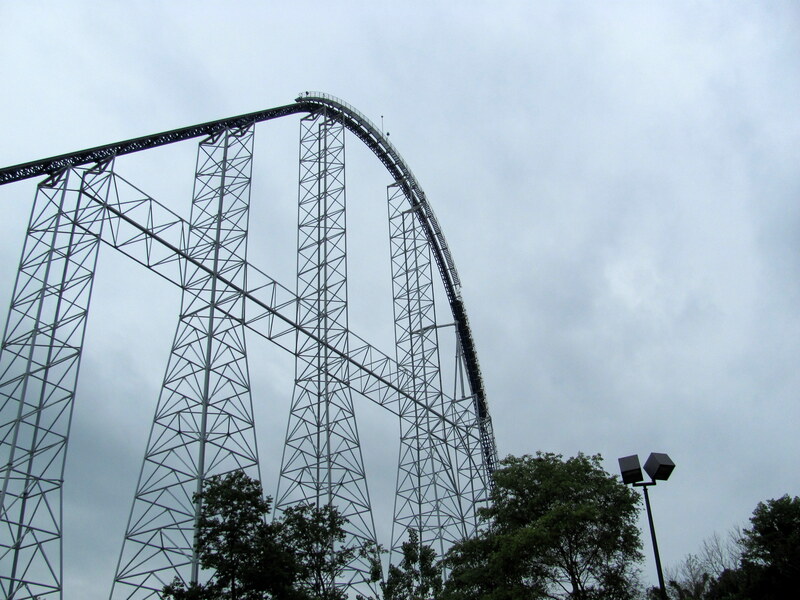 Two of the coasters in particular were amazing – the Millennium Force and the Magnum XL200. They both have drops upwards of 200 feet and travel over 60 mph. What a rush!!! After a long day at the park, my friend and I went to a quiet dinner at a place called Aladdin’s Eatery. The food was so good. They have an extensive menu of Middle Eastern food (mainly Lebanese). We liked it so much, we went back later in the week. The next day was supposed to be stormy all day. Thankfully, the weather forecast was (as usual) completely wrong. It was sunny and clear and about 70 degrees. Just spectacular weather! We decided to go to the Cleveland Botanical Gardens. Since I am a member of the Wildflower Center in Austin, I was able to get us in for free. The normal admission is $8.50 a person. It is definitely worth it. The first thing you do is go through a series of glasshouses. 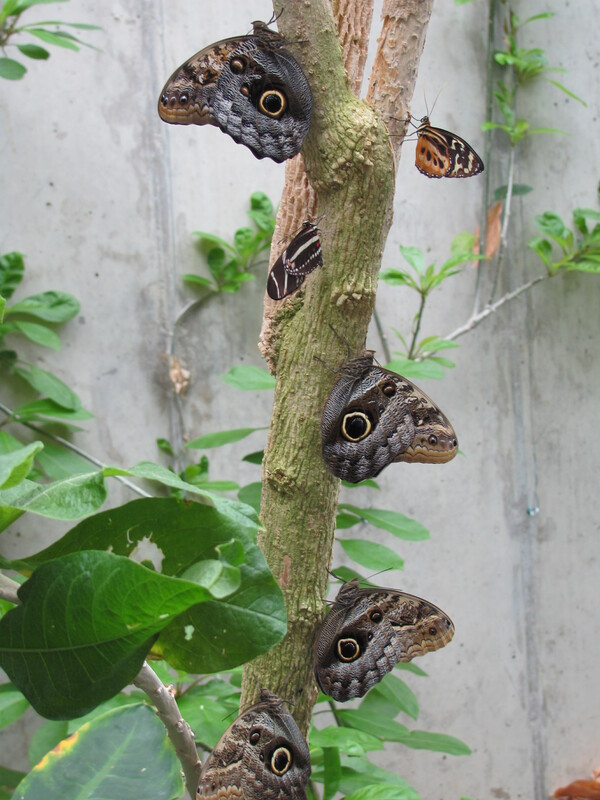 They are filled with great vegetation and plants, but more importantly, they are teeming with butterflies. There were dozens and dozens of them flying around us. We sat in there for about an hour enjoying the show. We then walked around the rest of the gardens. It was so peaceful and relaxing. It is not a huge garden, but it is very easy to get around and has some very nice areas (Japanese Garden, herb garden, rose garden, etc.) I think it is worth your time if you are into flora and fauna. Next, we went across the street to the Cleveland Museum of Art. This is a HUGE museum that has apparently been undergoing renovations for some time (which are due to continue into 2012). You have to walk around a lot of closed off areas to get to the exhibits that are open. But again, it was worth the time – especially since there is no charge for this museum. There were great works from the Old Masters going from the early 20th century back to the 17th century. 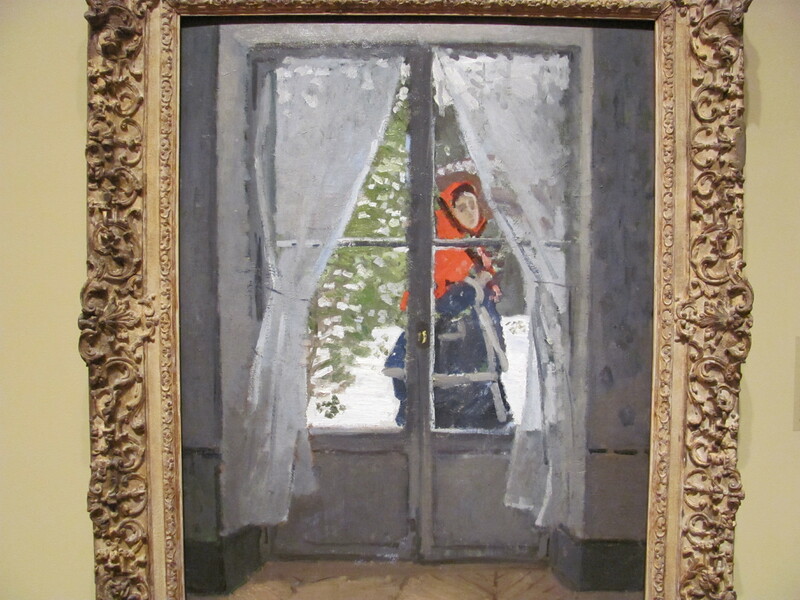 My favorite was a small section of cubist paintings and a section on American Impressionists. 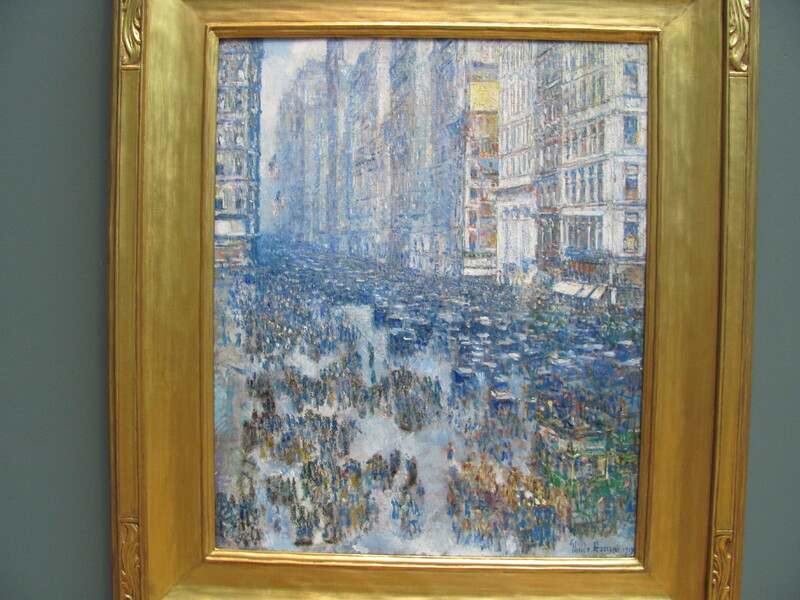 There was a painting of Fifth Avenue that was so cool. I loved it! The area that the Museum and Botanical Gardens are in is called University Circle. Case Western Reserve is in the middle of it. We walked around a little bit of the campus. It was also quite beautiful. Nearby is a place called the Glidden House. It was the home of the founder of Glidden Paints and was built in 1910. It is now a beautiful hotel. Not a lot to actually see, but the building itself is quite lovely. On another day, we visited the Lakeview Cemetery. I know – very macabre. But actually, many cemeteries are quite interesting to visit. 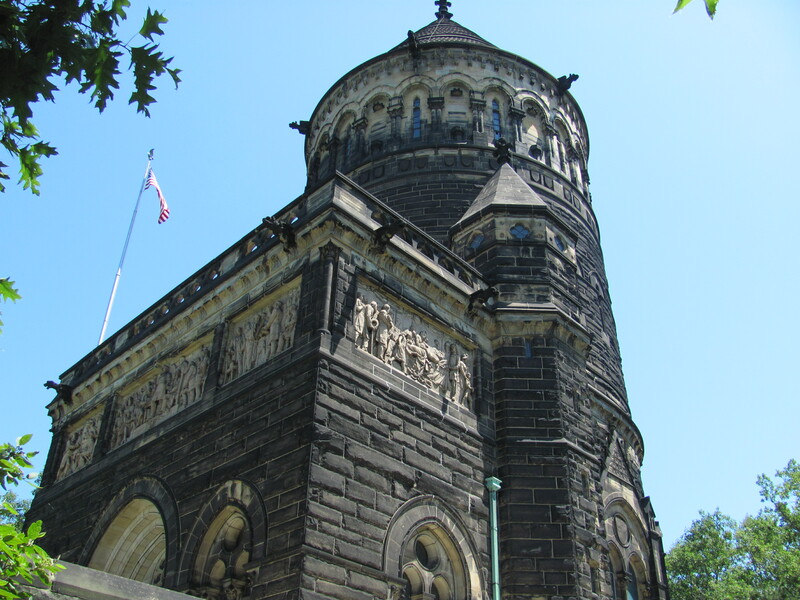 This one has a monument to President Garfield, as well as his tomb. The monument towers over the surrounding areas. 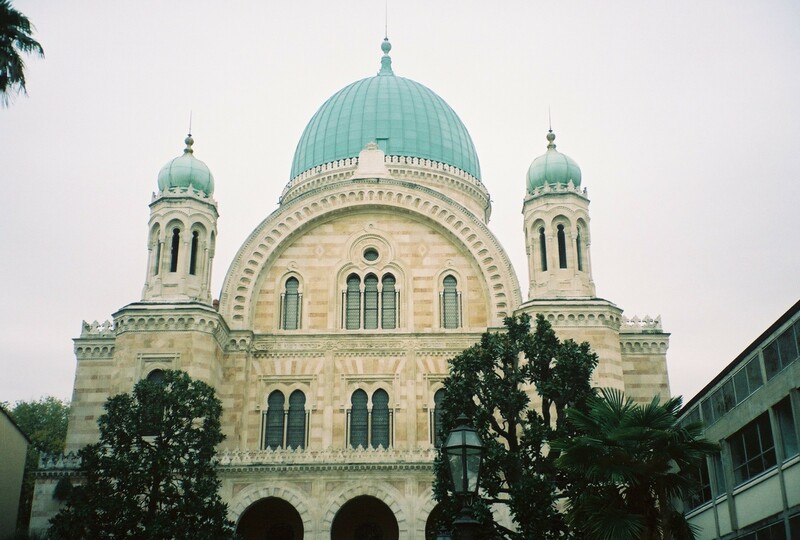 You can walk through it and see the beautiful mosaic domes and mosaic marble floors. The crypt is below and there is a statue of the President right as you enter. Also in the cemetery is the Wade Chapel, which was designed and built by Louis Comfort Tiffany. Of course it has a Tiffany Window, but it also has dual glass mosaics (on opposite walls of the chapel). The light fixtures and banisters are also quite stunning. It is a small chapel, but very beautiful. As we were driving out of the cemetery, we passed the grave of Elliot Ness, the famous federal agent who brought down Al Capone. We then decided to go downtown to get something to eat. We ate at the Terminal Tower. 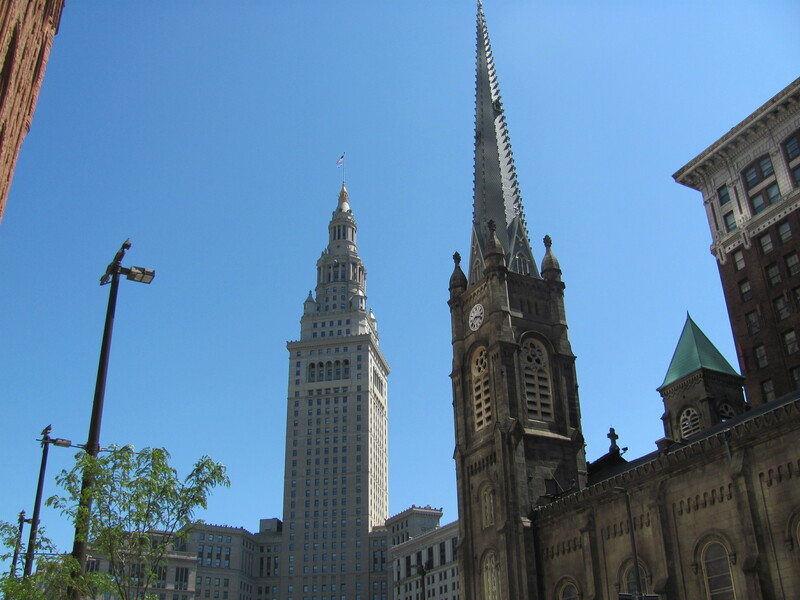 I don’t know if this is the tallest building in Cleveland, but it sure looks like it might be. The area around it is very clean and inviting. So many large cities have dirty downtowns. Not Cleveland. The Tower has a bunch of shops, a theater and many restaurants. Unfortunately, the shops were not terribly interesting. But the architecture is, including the train station that is inside (and I imagine gives the tower its name). Nearby is the Old Stone Church. This congregation dates back to the early 1800’s, though the building is not that old. The current building was restored in 1884, after a devastating fire. I love the juxtaposition of this old church and the modern buildings around it. Near the Church is a building called The Arcade. It is a Victorian indoor mall that dates from the end of the 19th century. It is beautiful. Again, the draw is the architecture, not the shopping. The place was empty – which is a real shame. It is a historical gem. 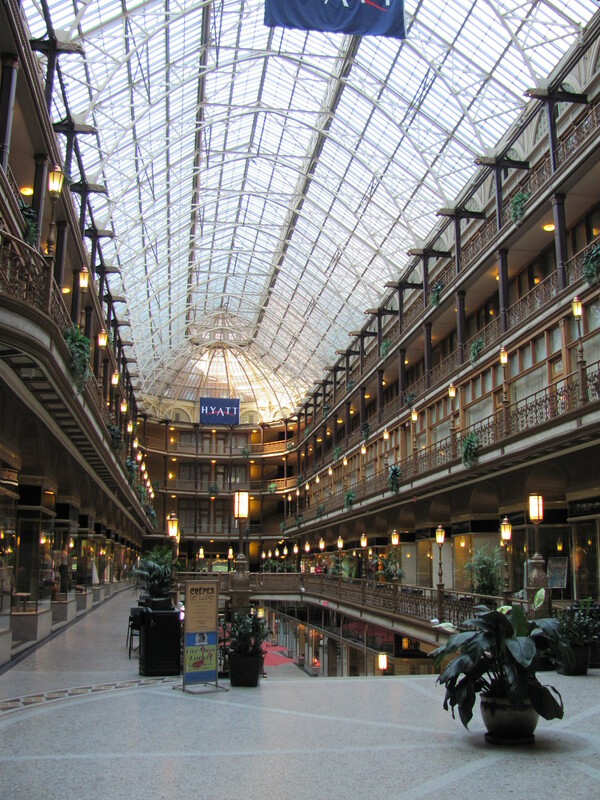 It was one of the first large-scale indoor shopping centers in the United States. We also walked around several interesting neighborhoods – Little Italy and Coventry. Both are filled with great restaurants and very interesting shops. Again, the weather was so nice, so it was great to just walk around. I know that Cleveland is probably not high on anyone’s list of places to visit. But its reputation is not deserved. It is a beautiful city with lots of interesting things to do. The people are incredibly nice and friendly. If you find yourself nearby, do yourself a favor and explore it. I enjoyed it thoroughly. To see some of my photos, click here. I just got back from Puerto Vallarta. This was my second trip there. I went in November 2008 with my partner and a couple of our friends. We had such a good time that we wanted to go back. We decided to go in February this time because it had still been quite hot in November. Well, the weather did not disappoint at all. Unfortunately, there were quite a few mishaps on this trip between our flight and our resort. I have been on a fairly good run lately with on-time flights. That string was broken with this trip. We left Austin about 30 minutes late and left Dallas over an hour late for the flight to Puerto Vallarta. What always steams me about the airlines is how they can insist that your flight will leave on time even when it is obvious that it won’t (the flight is due to leave in 20 minutes and the plane has not yet arrived!!!). The joys of air travel. So we finally get to Puerto Vallarta and that’s when we face the next problem. I retrieved my luggage and found that the shell (which is a hard case) had been literally ripped open. I went around looking for someone to talk to about this. Finally I was able to get someone from American Airlines and explain to them what had happened. There immediate and repeated response was to claim that they were not responsible and that their baggage handlers had not done it. I could not talk to anyone else, so I had to leave it that way. This was a bag I had just recently bought too! We get into our new room and find that it is musty and that the a/c does not work properly. It also has only a minimal view of the Bay/Ocean behind the resort. When we complained again, we were told that there were no other options until the timeshare staff came in the next day. So we put up with it for that night and the next morning went to deal with it all over again. We did finally get moved to another room that directly faced the bay and with an a/c that actually worked. So after much back and forth, the problem did finally get resolved. The next hurdle was the fact that from practically the moment you check in, the staff is hounding you to do presentations. We were not interested. They were also trying to push us to purchase the all-inclusive option. This would normally have been $150 a day, but if we did the presentation, they would give it to us for $50 a day. We still were not interested and had to say no at least 3 times. As it turns out, the food choices at the resort were beyond horrible. We were SO glad on so many levels that we did not do the all-inclusive. (Of course, we probably never would anyway. We do not go on a vacation to just sit in our resort and do nothing else. If we wanted to stay in one place, we could just stay home). Once we got past all of the BS, however, we did have a very good time. We spent at least 4 afternoons sitting by the pool at the resort. 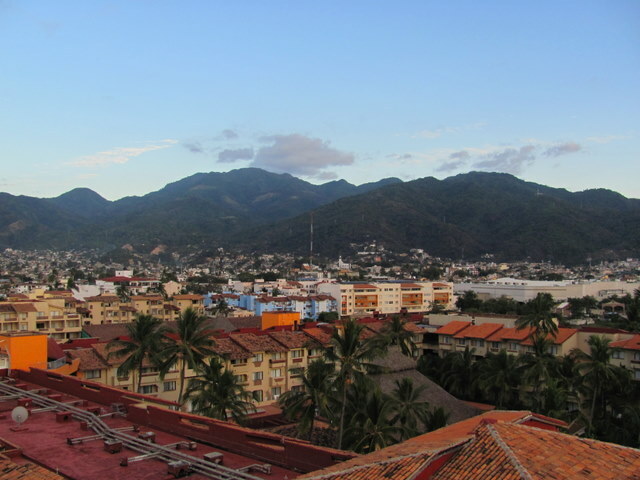 We spent several other days at the beaches – either in downtown Puerto Vallarta (at a beach called Muertos Beach) or in the town of Sayulita, about a 1 hour bus ride south of Puerto Vallarta on the Riviera Nayarit. Puerto Vallarta is a truly charming town. 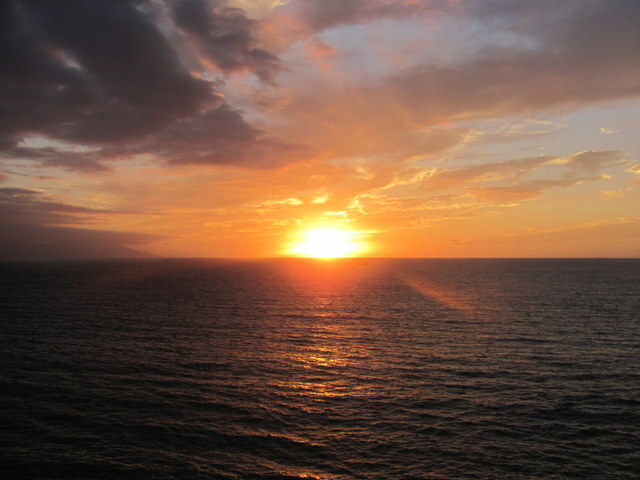 There is a lot to do there, but probably the best part is the spectacular beaches and gorgeous sunsets. We were outside to watch the sunset on all but 2 nights of our trip. Our resort had a bar with 2 hot tubs up on the roof of our tower (9th story). 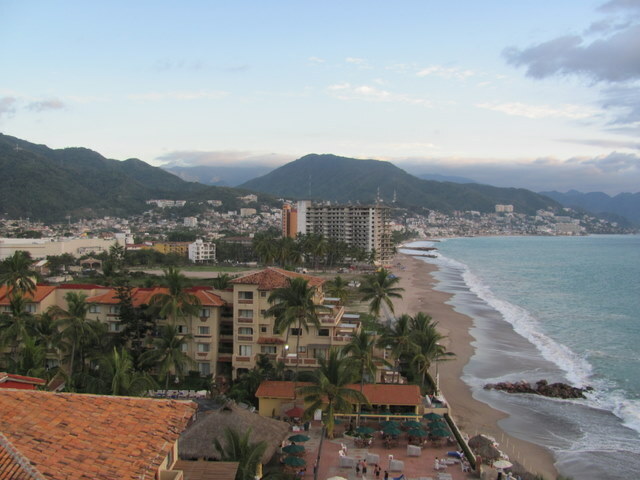 It had the most spectacular view – both of Banderas Bay (due west) and of the mountains to the east of the city. Man were those sunsets gorgeous. There is a pirate ship (or several) that does cruises out on the bay. It created a neat silhouette against the setting sun. At about 9:30 each night, it would put out a small (very small) fireworks show. Another thing that is really great in Puerto Vallarta is the food. We went to many restaurants all around town. Almost all of them were incredibly good. 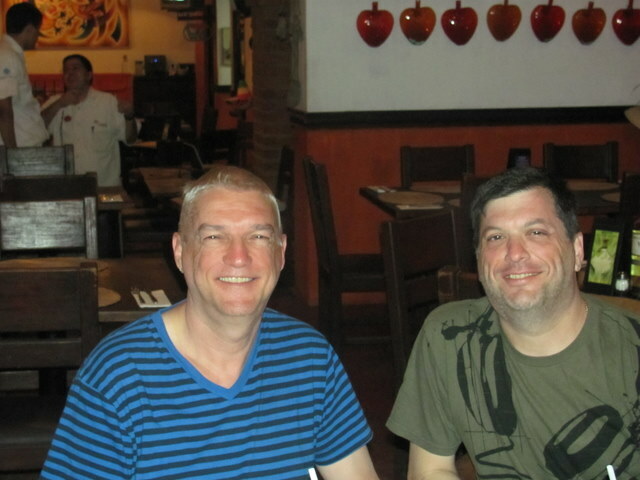 At one of them (El Rincon de Buenos Aires in the Puerto Vallarta Marina), I had one of the most delicious steaks I have ever had. Of course we ate plenty of guacamole and chips and salsa. And we had our share of beer and margaritas. I kind of slowed down on the margaritas when I found out that they have 500 – 600 calories each. Ugh! Probably the best thing about Puerto Vallarta is how gay-friendly it is. There are approximately 25 gay bars in the city. That’s about as many as in Fort Lauderdale! We went to 6 or 7 of them and really enjoyed them. By the last night, we were so tired out from drinking, that we just stayed in. Imagine that. I am sure that we will be going back to Puerto Vallarta in the future, but I am also really looking forward to exploring some other parts of Mexico too. Probably my next trip to Mexico will be to go to Cabo San Lucas. I have been wanting to go there for some time, and I think it will happen this year. Ah, Rome. I have now been twice and I find myself completely captivated by this city. With every step you take in this enchanting place, the winds of history blow all around you. You can feel the people that have lived here over the millennia. It is an electrifying and exhilarating place. I don’t know that I have been anywhere else (as an adult, anyways) that has so much history. Walking by the Circus Maximus, it does not take much to imagine the races that took place there in the first century. Walking by the Arch of Titus, I feel the history of Titus’ conquest of Jerusalem and destruction of the Temple in 70 AD. 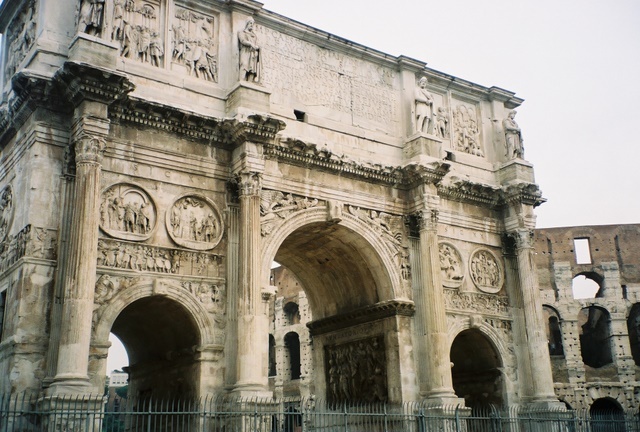 (Until the modern State of Israel was born, the Jews of Rome would not even walk through this arch). Walking in the Colosseum is especially poignant. This remnant of a 50,000 seat stadium is possibly my favorite building in the world. 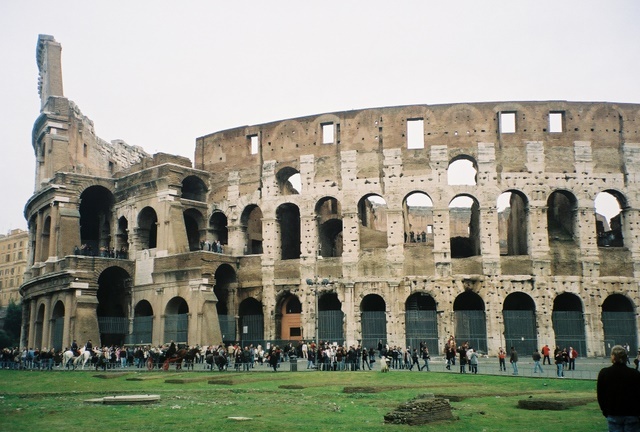 I only went inside the Colosseum once, but I have walked around it dozens of times. It still thrills me each time I see it. It is such an amazing tribute to the Ancient Romans. To think that this building has been standing there for nearly 2000 years – it’s just incredible. And I think of the events that took place in this stadium – naval demonstrations, sporting events, gladiator fights, feeding Christians to the lions… It was definitely a focal point for Roman culture in its day. 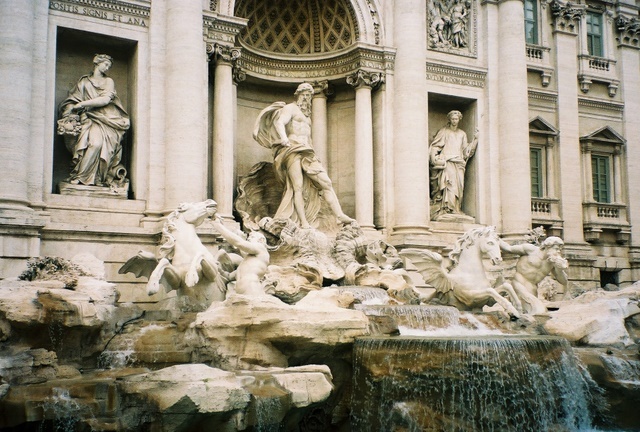 The first time I went to Rome, we were staying near the Termini train station. We got on the subway and saw a stop named Colosseo. I figured this was near the Colosseum, so we went there. Coming out of the stop, the Colosseum is literally right in front of you. It was early evening and we had the place to ourselves. It was glorious. We went back the next day to see it in daytime. What a difference. It was hot and crowded, but still quite spectacular. Near the Colosseum is the rest of the Ancient city – the Roman Forum, Titus and Constantine’s Arches, and various other ruins. There was a major difference between our first trip (in 1997) and our last trip (in November of 2009). They are now charging to enter the Forum and the rest of the Ancient City. We got to walk around the whole area in 1997 with very few other people around us. This last time, the place was mobbed (and we were not even there in season). I guess I cannot begrudge them charging for access, as long as the entrance fees are used to maintain the site. In our last trip, we stayed at a place through our timeshare called the Palazzo al Velabro. It is just a block from the Circus Maximus and is only a 10 minute or so walk from the Ancient City. I got to say that I am LOVING my timeshare. We have now used it in Hawaii, Madrid, Florence and Rome, and all of the accommodations have been great! The only complaint I had with the Velabro is that the internet access cost about $30 a day (yes – per day!!). 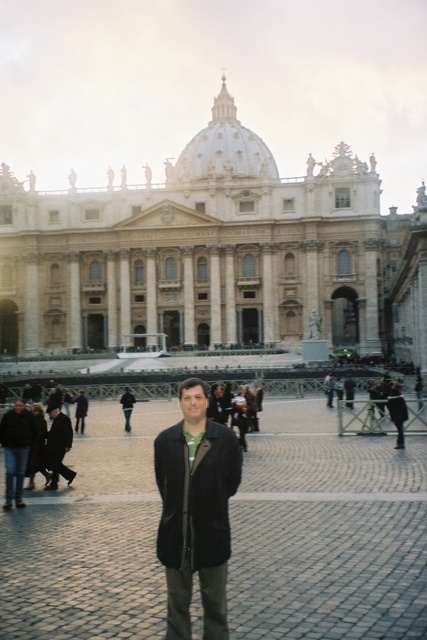 Of course, one of the highlights of visiting Rome is going to the Vatican. Again, we saw a huge difference between our 1997 and 2009 visits. They have now put up metal detectors that everyone must pass through before entering either St. Peter’s or the Vatican Museum. St Peter’s Square also has large screens in it and even some advertising billboards (can you believe it?!). Again, I understand the need for added security and have no problem with it. It is well worth the minor hassle. St. Peter’s Basilica is probably the most beautiful building in the world. I am always moved when I go in. In our first trip to Rome, we made sure to come to St. Peter’s on the day that the Pope does his blessing over the Square. The Pope at the time was John Paul II, who as Popes go, was a pretty admirable man. You can even arrange to attend a mass with the Pope, but we did not do that on either visit. The Vatican Museums defy description. There is so much art and sculpture everywhere that it becomes sensory overload. Then there is the magnificent Sistine Chapel. I did not get there in my last visit, but if you have never been and you are going to be in Rome, it is not to be missed. One of the most interesting things about Rome is the Romans themselves. They are beautiful people, but also can be quite gruff and rude, and very self-absorbed. I know this could be said for a lot of people and groups of people, but it seems to be especially true in Rome. One of the things that all Romans get used to is the constant interruptions of demonstrations and work stoppages. On both of our trips to Rome, there were frequent interruptions of the subway lines and trains due to these demonstrations. So it is kind of a crapshoot as to whether you will be able to use the subway. Another treat in Greater Rome is visiting the catacombs. We took a bus out to where they are and then you can go on a guided tour. You wouldn’t want to go without a guide because it is very easy to get lost. The passages go on and on and there are graves that date back to the 2nd century AD. It is also very cool in the catacombs. So if you are visiting in the heat of the summer, it is a welcome respite. You can also walk on the nearby Appian Way, a marvel of Roman technology. About an hour’s train ride from Rome is Naples, gateway to Pompeii and Herculaneum. We made the mistake of going on a regular train, as opposed to the Eurostar. The regular train takes much longer than an hour, is not air conditioned, and does not have assigned seating. The Eurostar is a high speed train that is quite comfortable and quick. It costs a little more, but it is well worth the difference. (The regular train from Rome to Naples is 2 ½ hours.) We decided to go to Herculaneum instead of Pompeii (I always like to take the road “less traveled,” so to speak. It is very captivating and more than a little eerie to visit this city which was buried by an eruption of Mount Vesuvius in 79 AD. The eruption created a layer of ash which covered both Herculaneum and Pompeii, thereby preserving the existing state of both cities and giving us today an incredible glimpse of what life was like at the time. Another interesting thing that we did was to visit the Jewish Synagogue. While there, we learned a lot about the history of the Roman Jews from the time of Christ up to today. There is a great Jewish Museum attached to the Synagogue. The tour of Jewish Rome takes you into the current Synagogue, as well as what remains from 5 much older synagogues. Again, the difference between our 1997 visit and 2009 visit was amazing. It is much more organized now. It is definitely worth your time if you have any interest in Jewish history. Of course, no discussion of Rome could be complete without talking about the food. Having been in Florence, Naples, Venice and Rome, I can say with confidence that Rome has the best food in the country. Everywhere you go seems to be amazing. It is very hard to have a bad meal there. Often you will see the fresh vegetables being gathered from baskets at the front of a restaurant to be used in the cooking. Be adventurous and try things other than pizza and pasta – it is worth the effort. All in all, Rome is a captivating city. I hope I will have the chance to go back again in the future. To see some of my pictures from Rome, click here. 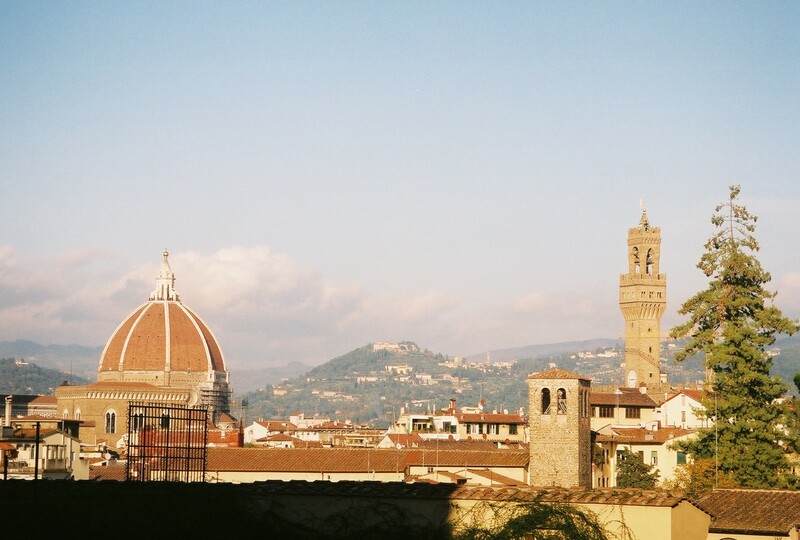 My first time in Florence was in June of 1997. My partner and I were in Rome for a couple of weeks and decided to take the train up to Florence and “check it out.” We got to Florence about 10:15 am. We left in the late afternoon to go back to Rome. In that time, we were able to see an awful lot. However, it did leave us wanting more. So on our recent trip to Italy, we decided to spend a few nights in Florence so that we could see more of the city. Florence is very different from either Venice or Rome. Rome is gigantic and it takes a while to take it in. Venice is unlike any other place in the world. Florence is a compact city. This makes it easy to see the whole city in a few days. You can take longer if you want, but you don’t have to. 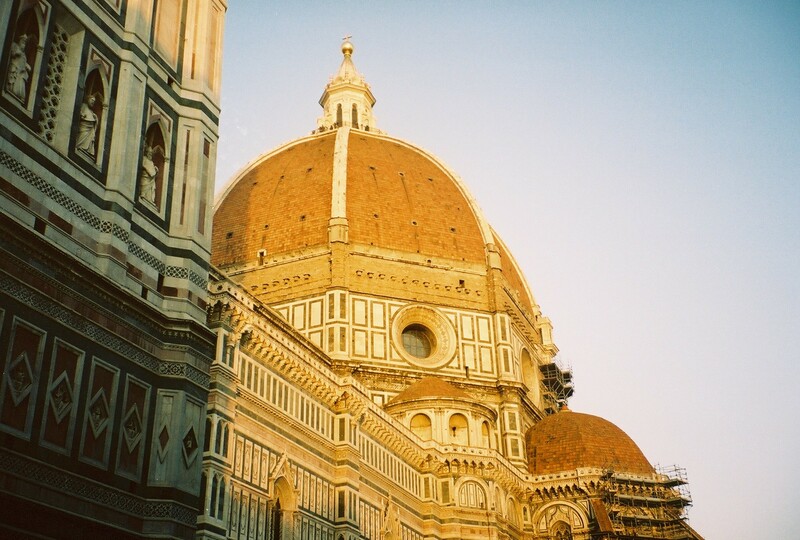 Florence is one of the major centers of art for the world. The Renaissance more or less started in Florence. Because of that, the amount of world-class art from the 16th through the 18th centuries is astounding. We visited the Uffizi Gallery on this latest trip. It was our first time there. Let me tell you that it was worth the wait. This is one of the most impressive museums that I have ever visited. The building itself is a masterpiece. But the paintings and sculptures housed inside are truly breathtaking. We spent about 3 hours there, but you could easily spend the entire day. Be warned – the place is extremely busy. A good tip for visitors – contact the museum ahead of time (or your concierge at your hotel) and get tickets in advance. You pay a few extra Euros for this, but it allows you to basically walk right in at your appointed time, bypassing the long lines. 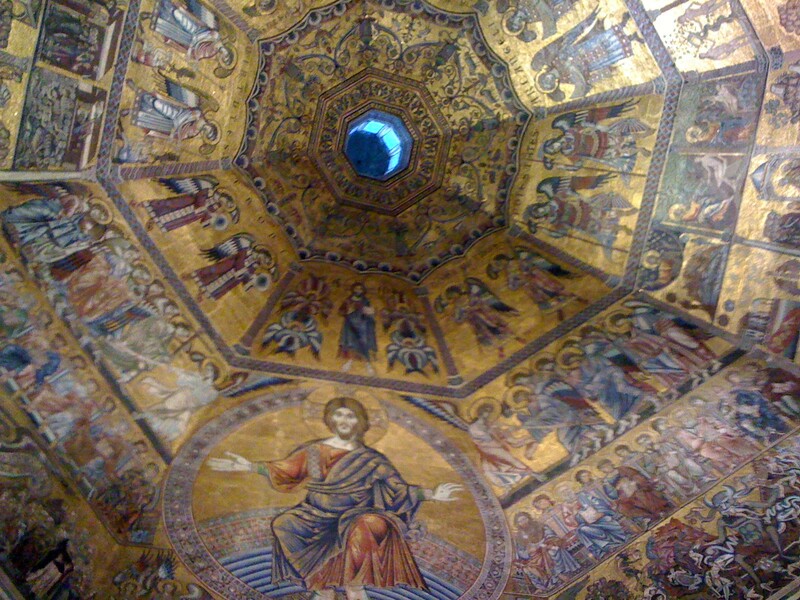 One of the real treats in Florence is the Duomo (also known as the Basilica di Santa Maria del Fiore) and its Baptistery. The Duomo is free to enter. 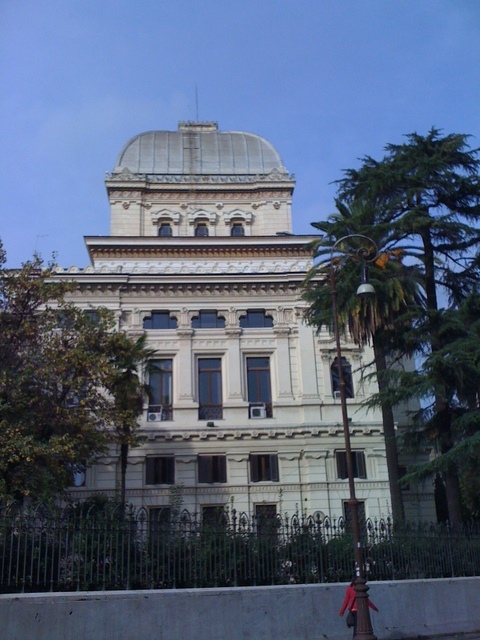 It is a large, domed (thus “Duomo”) basilica that you can’t miss when you are walking around the Old Town. The outside design is absolutely gorgeous, with carved wood doors and marble statuary everywhere. The inside is not as over-the-top, but it is still quite beautiful. Across the square from the Duomo is the Baptistery. This has 3 sets of gorgeous bronze doors. The building dates back to the 11th Century. But the real treat is when you walk inside. The massive mosaics depicting various Biblical themes are beyond description. My partner and I basically sat down and just gawked at the mosaics for about 15 or 20 minutes. This is something that is not to be missed. Next to the Duomo is the Campanile (bell tower). You can walk to the top – we didn’t. It is about 500 steps and we were already exhausted. There is no elevator, so walking up is the only option. It is a shame as I would have loved to see the city from this vantage point. But it was not meant to be. You can also walk up into the Dome of the Duomo. It is also some 500 steps and has no elevator. Again, it is supposed to be an incredible view from up there. On the other side of the Duomo is a museum called the Opera del Duomo (literally “works of the Duomo”). It is filled with statuary and other items from the Duomo. They are kept in the museum for safe keeping. It is some of the most breathtaking marble sculpture I have ever seen. There are two full sized marble pulpits on display as well as numerous other statues. I know that this is a lot of superlatives, but it is warranted. When we went to the museum, despite the crowds around the Duomo, there was almost no one there. That is a shame. It should be on the must-see list for any visitor. The Ponte Vecchio (or “Old Bridge”) is one of the few remaining medieval bridges left in the world. It is lined on both sides with shops (mostly jewelers). The current bridge was built in 1345 and the shop stalls date back to that time period. It is interesting, though hardly one of the most impressive things in Florence. Fortunately, though, it is not filled with t-shirt and postcard shops. The shops are real businesses. 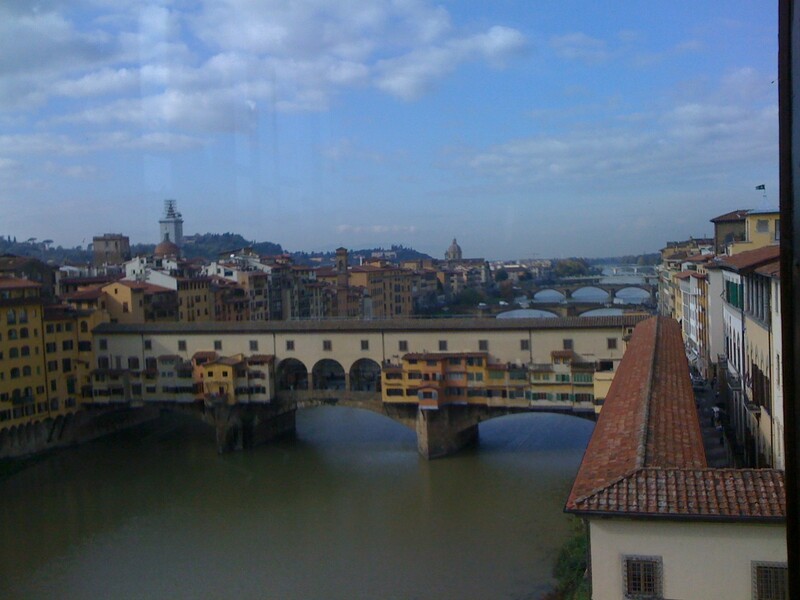 Just on the other side of the Ponte Vecchio is an old Medici palace called the Pitti Palace. This very large building houses a number of interesting museums, including a silver museum, a porcelain museum and a costume gallery. But for us, the draw was the Boboli Gardens. This is a huge (11 acre) garden area behind the palace. You could spend hours walking around the gardens enjoying the awesome views of the city of Florence, the statues and the fountains. We really enjoyed it. It is a quiet, serene and refreshing break from the hustle of the more popular attractions of the city. Another treat in Florence was visiting the Jewish Synagogue and Museum. The Great Synagogue was built in the 19th century and nearly destroyed by the Nazis during World War II. First they used the building as a warehouse and stable. Then they actually laced the whole building with explosives. Due to the heroic efforts of the local partisans, the majority of the bombs were diffused. Only one section actually got detonated. Most of the building survived. I know that a lot of people give very little time to Florence. They go for a day or two at the most and then move on to the next city. It deserves more attention than that. It is a wonderful place and the art and architecture are truly inspiring. To see some of my pictures from Florence, click here. I recently returned from a trip to Italy, during which I got to visit Rome, Florence and Venice. 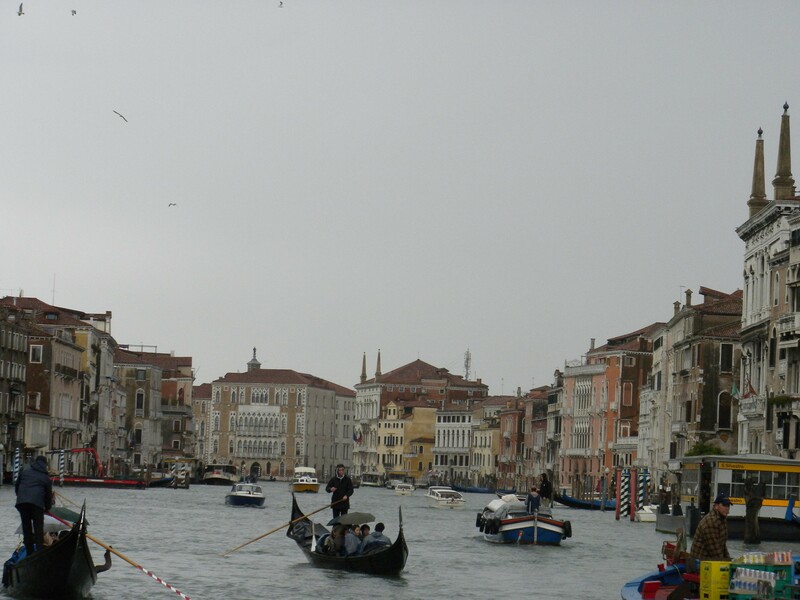 This was my second time in Italy, but my first visit to Venice. I can assure you that it will not be my last. Over the years, I have heard so much about Venice and at times have wondered if it is possible for any city to really be all the things that people have said about it. Well guess what – it is all that and more. It is a truly indescribable place. It is mysterious and beautiful. It is a dream built on the impossible that has somehow survived for 1500 years now. It is a relic of a city struggling in a modern world that it seems to want no part of. Did I mention that it is beautiful? Its beauty really is beyond description and I believe that it is nearly impossible to convey it in words. It has to be experienced. So what is it about Venice that is so enchanting? Let’s start with the fact that there are no roads, and thus no cars, buses or motorcycles. Even bicycles are not allowed. When you get there, you don’t realize how quiet the place is (even with all of the crowds) because there is just nothing to compare it to in this regard. When you leave Venice is when it hits you. When you get back to the traffic and the noise of a modern city, you realize how quiet – dare I say serene – Venice is. I find myself wishing that there were no cars in my city. It really is a different lifestyle when you don’t have motor vehicles racing all over the place. 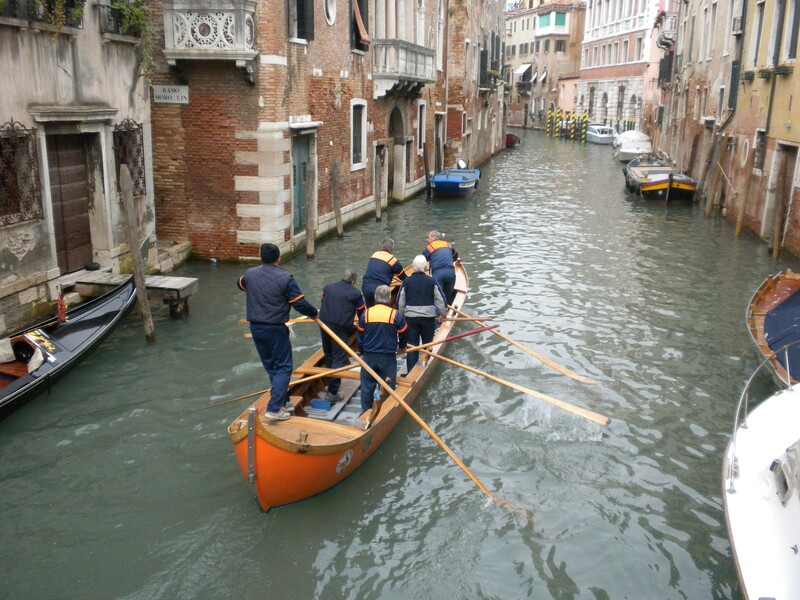 Of course Venice is filled with boats, many of which are motorized. So on the Grand Canal, traffic can be as bad as any highway in the world. But it is still different than car traffic. Then you have the actual buildings all over the city. 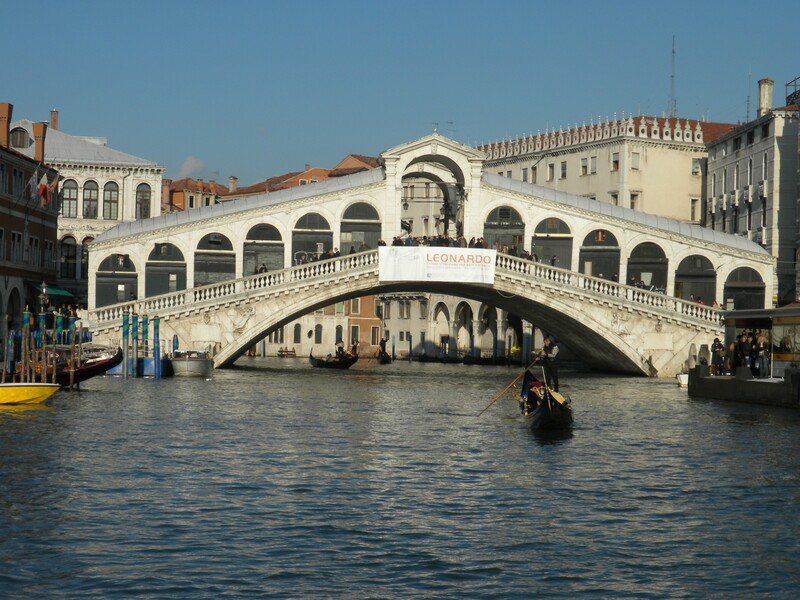 Venice is made up of about 120 islands that are strung together by pedestrian bridges over all of the canals. The Canals themselves are the “roads” of the city, as they have been since the 8th Century. I think it has probably been a few hundred years since any major construction of houses or “mansions,” especially along the Grand Canal. So the properties that you see are actually not only stunning but quite historic. Unfortunately, the expense of maintenance has caused many of them to be abandoned. Venice is an extremely expensive city to live in. And the constant maintenance that is necessary to keep these “houses” up is also prohibitively expensive. After all, most of the buildings are not built on solid ground. They get rested on hundreds of wood pilings that are driven into the bed of the lagoon. And the level of the water around the lagoon seems to be rising, while at the same time the foundations of the buildings are sinking into the seabed. It makes for a rather tense situation. And as far as I understand things, there is not a great deal of consensus as to how to deal with the problem. But let’s forget about the problems and concentrate on the great things about Venice. We arrived at the Marco Polo airport, which is on the mainland, and took a bus over to a square near the train station (which is actually in Venice). From there, we walked with our luggage, doing our best to find our way over the various canals to where our hotel was located. It took us a while, and a few missteps, but we eventually made it there. We stayed at a hotel called the Hotel Abbazia. Abbazia is an Italian word for Abbey and the name comes from the fact that the hotel is actually a converted Abbey. I assume the Abbey belonged to the church that was nearby (St Maria di Nazareth), but I am not completely sure. Regardless, the place was an absolute treat as a hotel and the staff of the hotel could not have treated us better. That is always something I am concerned about in Europe, as the standards tend to be a bit different from US hotels, and those that work in the service industry in Italy are not, in my opinion, always particularly friendly. After collapsing in bed as a result of our almost 24 hours in transit, we woke up the next day ready for our Venetian adventures. Unfortunately, the weather was kind of bad. It was cold and there was a steady rain all day. But we were prepared for this possibility, so we did not let it hold us back. Venice is a city completely overrun with tourists in the summer time. I knew that I did not want to have to fight off the hordes on my first trip there. That is why I scheduled our trip for November. The drawback with November is the wet weather. It is not guaranteed to be wet, but it often is. The byproduct of all the rain is that there is flooding around the city. Some of the Fondamentos (the “streets” along the canals) end up being partially or completely flooded. And St. Mark’s Square is almost always flooded during this time period because it is the lowest part of the city. The waters covered most of the square, and even managed to flood St. Mark’s Basilica. The city is prepared for this acqua alta (high water) and erects elevated walkways for people to be able to walk above the flooding. Interestingly, the city was still quite crowded. If this is the offseason, I would really hate to see the high season. There were hundreds of people in line to visit St. Mark’s Basilica. But it wasn’t too bad. The cathedral is truly awe inspiring. The mosaics and Byzantine-influenced art is breath taking. But Venice is FILLED with churches. We visited about 15 of them. Not only are the buildings and the altars beautiful, but they also contain incredible paintings from the likes of Titian, Tintoretto and other great Venetian artists. 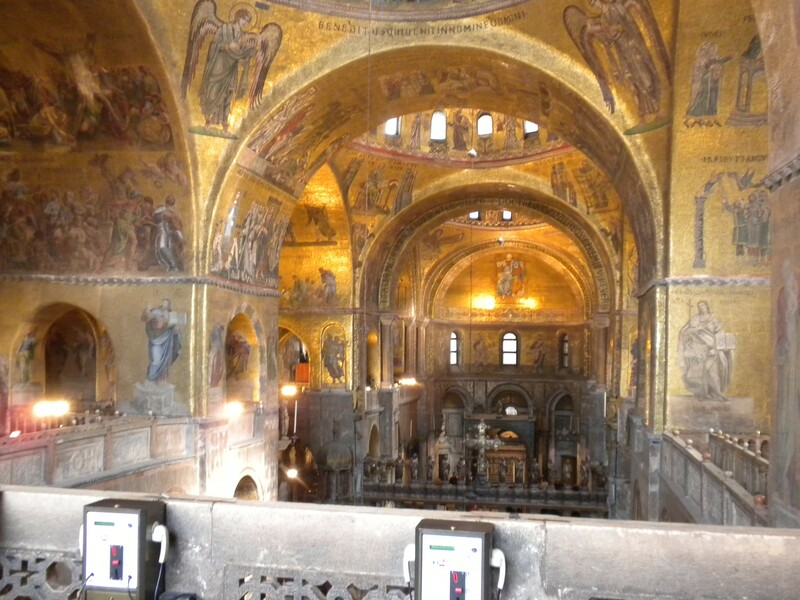 And I have to say that St. Mark’s was not my favorite (though it is very impressive). My favorite was the Santa Maria Gloriosa dei Frari (referred to as the Frari by most people). This church was a little unusual as it had monuments to individuals that are not saints (Titian, for example). I didn’t know a Catholic Church would do that, but this one did. The place is absolutely huge. Other notable churches we visited are Il Redentore, Il Salute, San Giorgio Maggiore and Santa Maria Assunta on the island of Torcello. This last one is the oldest building still standing in Venice, dating back to the 7th or 8th century. It has some of the most spectacular mosaics I have ever seen anywhere and is well worth the time it takes to get to Torcello. The mass transit system of Venice consists of a series of boats called the Vaporetto. 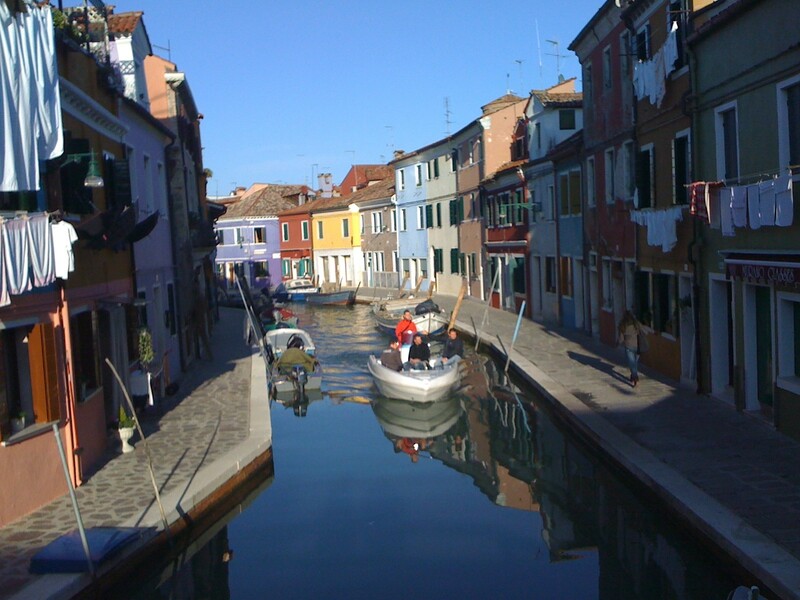 They hold about 100 people or so each and the system can take you all around the various islands of the main city, as well as to Burano, Murano, Torcello and the airport. It is a very efficient system and it is a GREAT way to see the city. We enjoyed just sitting on a vaporetto that rode all the way through the Grand Canal. When it isn’t raining, I think it may be the best way to get an overview of the city. I can’t talk about the time in Venice without discussing the Jewish section of the city. Venice was a city that allowed Jews to be permanent residents pretty early on (starting in the early 1500’s). They were confined to a specific area of town. That section became known as the Ghetto. It is where we get the word from. The word comes from the Venetian word for Iron Foundry (Geto) that turned into Ghetto. Even though the Jews would be locked up in this section of town at night, it still was a step forward for them. In present-day Venice, you can tour the Ghetto as well as 3 of the synagogues (or “scuolas”) that date from this period of time. The synagogues were divided based on the origins of the practitioners; Sephardic Jews (from Spain and Portugal) worshipped at the Spanish Synagogue. Eastern European Jews (what we now refer to as Ashkenazi) worshipped at the German synagogue. The Levantine Jews (from around the Mediterranean and Turkey) also had their own synagogue. It is interesting that with all of the prejudice of the Christian community against the Jews, they had to further divide themselves within their own community. You get to see three of the synagogues on a guided tour. They are really quite interesting. The Jews did not build their own synagogues. They would use a room or floor in an existing building. There is also a monument to the Holocaust and another one specifically for the Jews that were deported from Venice by the Nazis. If you get to Venice, I highly recommended this tour. Hopefully you will get a friendlier guide than we had, but even if you don’t, it is a memorable experience. There is so much more I could say about Venice, but the best thing to do is to try to experience it for yourself. To see some of my photos, click here. And enjoy!! My partner and I have just returned from a whirlwind tour of 5 of the 6 states in New England. We were fortunate enough to experience the fall colors at their peak in the northern part of New Hampshire (the White Mountains). This is the third time that we have gone to New England to witness nature’s show. I assure you that it never disappoints. The range of colors that can be seen in the foliage is so spectacular. We started our trip in Rhode Island. Our hotel was in Providence, but we actually drove down to Newport on the first day. We toured 2 of the Gilded Age mansions (The Breakers and The Marble House). Our friends toured two additional mansions (Chateau Sur Mer and The Elms). These houses really defy description. They are so immense and so opulent. The sick part is that they were only used for 6 weeks out of the year. While in Newport we went to the Touro Synagogue, which is the oldest synagogue in the United States. It is a small synagogue, but I found it to be very beautiful. And the story of the people of this synagogue is very interesting. They feel that they had a strong part in keeping church and state separate and in fostering religious tolerance in the US as a whole. Back in Providence, the main thing we did was to tour the State House. I have been to a number of State Capitols, but this was by far the most beautiful that I have ever seen. The current one was built in the early 1900’s, but the original State House is still standing and we also toured that one. We spent 4 days in the southern part of New Hampshire at a resort called Crotched Mountain Resort. It is a part of our timeshare company and we thought it would be a fun anchor for part of our New England tour. To say that it is out of the way is an understatement. We ended up driving on country roads and roads that were not even paved to get to the resort. Our GPS was very confused to. In fact, John and I considered the phrase “Recalculating Route” to be a theme. We tried to follow the directions from our GPS, but when the directions did not match with the roads in front of us, we would find ourselves off of the suggested route, and the machine would announce that it was recalculating the route. It got to be very annoying after a while. GPS technology is great, but it seems that it has some issues in the less populated areas of the country (it also seemed to have a lot of trouble in Providence, RI, but that is a story for another day). Crotched Mountain Resort is about 30 minutes west of Manchester and Concord, NH. It is near the Crotched Mountain Ski Resort. It is a small resort (it only has 24 one or two bedroom units). We had a lovely two bedroom unit on the first floor. Some good friends of ours from Miami Beach joined us on this trip. This was the first time for one of them to see the fall colors. We did not actually go in this time (it was pouring rain and a little on the cool side), but we did drive around it and got to see the old, restored houses and the various workshops on the grounds. Instead, we drove over the border into Maine and had lunch at Warren’s Lobster House in Kittery. We had an amazing lobster lunch (after all, you should not visit this part of the country without having some lobster, clams and various other types of seafood!!). I believe this was my third time eating there and it has yet to disappoint. We then drove up along the Maine coastline, passing through York, York Beach, Wells Beach, Ogunquit, Kennebunkport and Biddeford (which happens to be where my partner was born and grew up). It was fun to drive by his childhood house and see the trees that he and his father planted in 1976. They are now 40 feet high blue spruces. We saw the 160 acres that once belonged to his parents. It has now been developed as a beautiful subdivision. The next day, we started out in Concord, the New Hampshire state capital. We were not able to go into the State House because it was a Saturday. However, we did walk on the grounds and look at the buildings surrounding it. There was also a small farmer’s market taking place in front of the Capitol. We left there and started our journey north on I-93. We drove about 90 minutes north to get to the Franconia Notch State Park, and visit the Flume Gorge. For those of you that have never been there, it is basically a “canyon” carved into the mountain by the water. It is not very wide (maybe 6 feet or so). They have installed a wooden walkway through it so that you can really experience it. It is a very cool place to go (this was my second time). The friends that went with us particularly liked it too. The only drawback was that it was pretty crowded. But that is to be expected during the peak of the fall colors. We “hiked” through the Flume Gorge (about 2 miles and all uphill 🙂 ). The weather was spectacular and the setting was even more so. I highly recommend this to anyone that is in the area. We then drove around Mount Washington, passing through North Conway and a number of other small towns. We drove up to the Mount Washington Hotel which is a grand early 20th century hotel. They now charge $10 for visitors parking, so we ended up just driving around the main driveway and taking some pictures. This hotel is where the Bretton Woods system was created by President Roosevelt and other world leaders in the aftermath of World War II. The next day took us into Vermont. The first thing that we did was try to find a sugar house I had seen on the internet. It turned out to be a small private farm with a tiny little store. Oh well – can’t win them all. Then we set out to find a cheese factory. We ended up at the Grafton Village Cheese Company in Brattlesboro, VT. This was worth the drive. It was a beautiful dairy farm with goats, cows, donkeys and miniature horses right out front. Inside we got to see how cheddar cheese is made and we also got to taste 10 or so different types of cheese. It was really good cheese! Yum! I ended up buying a pound of the aged cheddar and also some of their blue cheese-cheddar spread. I expect I will be ordering from them again in the near future. The rest of our time in Vermont was kind of boring, though. We went to a place called the Vermont Country Store. It is actually a pretty neat store, but it was impossible to enjoy it as 2 or 3 busloads of seniors had been dumped into the store while we were there, making the experience very uncomfortable for me (not because of the age – because of the congestion with all of those people in the store). I ended up waiting outside because I just could not stand it any more. The next day, our friends took off for the Boston area and John and I continued to northern New Hampshire to stay with some other friends of ours that run a B&B up there called the Inn at Bowman. We spent two relaxing days with them and really enjoyed just chilling for a bit. We went on a short drive to try to find a moose or two. Every time we go up there, they tell us about all the moose in the area, but we have yet to actually see one. I am starting to believe that moose are a myth, much like Bigfoot and the Abominable Snowman. We finished up our whirlwind New England tour in Auburn, Maine where we spent some time with my partner’s nephew. We ended up taking him back to the White Mountains in New Hampshire, where we drove up Mount Washington (the tallest mountain in New England). We could not drive all the way up, but we went as far as we could. It was a cold, windy day. But the vistas that opened up to us from the mountain were just spectacular. You could see the range of fall colors flowing up the sides of all the mountains. This is another experience that I highly recommend. It is a bit expensive, but it is totally worth it. If you do not want to drive your own car, there are also guided tours up the mountain. On the way back to our flight in Boston, we stopped at a restaurant that had been recommended to us (Kelly’s) and had a lobster roll. For those of you that don’t know what a lobster roll is, it is basically a hot dog bun stuffed with pieces of lobster (and usually a little celery and mayonnaise). It is quite delicious.